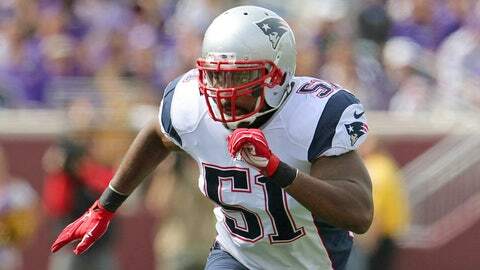 Jerod Mayo will miss the rest of the postseason with a shoulder injury. The New England Patriots will be down a key linebacker for the remainder of the postseason. Jerod Mayo, who suffered a shoulder injury in Saturday’s win over the Kansas City Chiefs but did not return, will be placed on season-ending injured reserve, the team announced Tuesday. Mayo played all 16 games in the regular season, making eight starts. He was the No. 3 linebacker behind Jamie Collins and Dont’a Hightower, but fell to fourth on the depth chart thanks to the emergence of Jonathan Freeny. Mayo didn’t make a tackle in the divisional round before suffering the shoulder injury. According to Mike Reiss of ESPN, Mayo played just 36.2 percent of the team’s snaps. Jerod Mayo played 36.2 percent of the defensive snaps in regular season. Finished with 49 tackles, 1 sack, 1 pass defended. This injury is particularly interesting for his contract status. If the team exercises his option for next season, he will have a cap hit of $11.4 million — second-highest on the team. There’s no doubt the Patriots would rather have him healthy going forward, but he hasn’t played up to his contract. If the Patriots don’t pick up his option for next season, he can sign with another team. He should generate some interest, but the injury could play a role in that.